This tutorial shows you how to make a basic Teneriffe lace medallion using the Teneriffe Lace Looms from Gina-B Silkworks. This takes you through reading the patterns, adding holding stitches and working the Teneriffe Lace knot. Loom No 1 (from the Teneriffe Lace Kit) is shown here, but the method of working is the same for all of the looms. Gina Barrett is a partner of Gina-B Silkworks, a company that seeks to bring traditional textile crafts and techniques to a modern audience. She has appeared regularly on the Create & Craft TV channel (since 2011) with these kits and teaches workshops. She has provided reconstructions of buttons, narrow wares, passementerie and costume accessories for theatre, film & television, museums & stately homes, costumiers and private individuals since 1999. She has also provided couture and modern bespoke trimmings using traditional techniques for designers and artists (both clothing and interior). These include varied commissions from buttons for film and TV, tassels for Buckingham Palace Mews, and woven fringes and girdles for historic reconstruction. She has also written books and articles about many of the techniques she has acquired, including “Buttons: A Passementerie Workshop Manual”, “The Ganutell Country Flowers Handbook” and “Tak V Bowes Departed” (co-authored) as well as 6 booklets on medieval narrow wares, and regularly produces how-to articles for magazines, as well as papers and essays on other forms of passementerie. 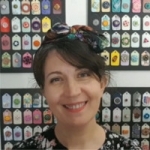 In 2016 Gina set herself a challenge - “One Button a Day”, to create a passementerie button and share the image on social media every single day. The fact that it was a leap year was not one she had thought of in the January, so she did complete 366 buttons! These ranged from reconstructions of historical buttons, traditional styles, and button designs that were totally unique. Gina is a trained illustrator, with a background in historical and diagram illustration and graphic design. Her passion for textiles grew from studying historical costume for her illustrative work. Previous clients include: Henry Poole & Co / Buckingham Palace Mews, Hawthorne & Heaney, Celtic Bak Productions (Born a King, 2018), Gabriele Mendela (Costumier), Prior Attire (Costumier), Ninya Mikhaila Historical Costumier, The Tudor Tailor, Dover Castle, Luton Museum, Dombey Street Productions (Tim Burton’s Sweeney Todd), Noseley Hall, The Globe Theatre, The Victoria & Albert Museum, The Tower of London, Hampton Court Palace, Perth Museum & Art Gallery, The Royal Amoury, Leeds, Suzi Clarke (Costumier), Gary Smedley, Harman Hay, Harriet Waterhouse (Costumier), Chimera Costumes and numerous private individuals.